Men's basketball coach Oliver Purnell answers questions about the new arena. With a new $140 million state-of-the-art arena introduced by Mayor Emanuel, DePaul University’s basketball program eyes the opportunity to move from Rosemont to downtown Chicago, making the city their home again after 30 years. What’s been talked about for months finally came to fruition on May 16, when Emanuel announced the plan to build a new facility at McCormick Place for the DePaul Blue Demons to play their home games. The plan includes a $173 million tourism and event center with the new arena at the heart of it. 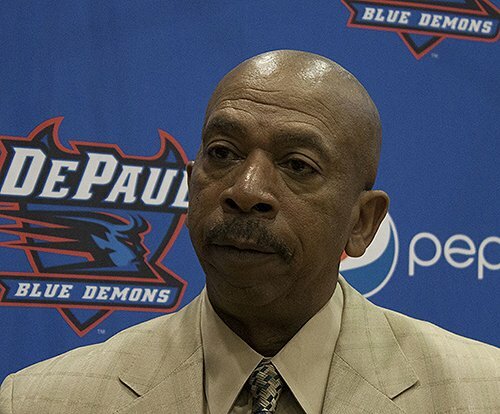 After a full generation passed the success of legendary coach Ray Meyer’s final season, DePaul has taken a giant leap from returning to the base of the Chicago sports scene. “This is one of the key ingredients, one of the key recipe parts that’s been missing from DePaul for the last several years,” Athletic Director Jean Lenti Ponsetto said. “Major colleges and universities the size of DePaul have spectacular facilities for their student athletes and for their students on campus. From that perspective, we’re probably a little bit behind,” she said. A little bit behind is now the past and the new 10,000-seat arena and event center is now the future. The arena will also come equipped with 22 suites, 300 club seats and a gross of advertising opportunities. DePaul can keep the revenues from those during basketball and other university-related events. DePaul will contribute $70 million for design and arena construction. The Metropolitan Pier and Exposition Authority will contribute the other $70 million along with $33 million in tax increment financing funds to cover costs of the land. That brings the total cost of the arena to $173 million, including land costs. The remainder of the $300 budget goes for two hotels and other development at McCormick. DePaul President Dennis Holtscheneider said the school considered as many as 12 other properties around the city close to the Lincoln Park campus to build the arena. With the South Loop playing host to the new arena, students will have a much more efficient and shorter trip to the games. The new arena will bring the men’s basketball program back to the city, helping the program reach an equal playing field with its competitors in the newly constructed Big East Conference. Before, DePaul was not able to keep its top local talent from fleeing to other national contenders, such as Simeon’s Jabari Parker who turned down DePaul for Duke. But now, with new facilities and a potential revamped fan base in the city, the basketball program will look to keep local talent in Chicago. “One of the first two things that I hear from either prospects, coaches, friends of prospects is, ‘You’re doing a really good job, you’re developing.’ And the next thing I hear is, ‘Boy, if you only [played] in Chicago,” men’s coach Oliver Purnell said. Even before the announcement of the new arena, Purnell and his staff signed an ESPN Top-100 recruit in Billy Garrett Jr. from local Morgan Park High School, the program’s first ESPN Top-100 recruit since 2007. Garrett’s dad, Billy Sr., is an assistant coach on Purnell’s staff. They also manage to lure big man Thomas Hamilton Jr. who played three seasons at Whitney Young High School before transferring to IMG Academy in Florida. It’s the first time in several years DePaul will have a forward with his size and skill set. The biggest impact the new arena will have on DePaul could be the students. The 15-mile trek to the current arena in Rosemont forces students to take a shuttle to home games without an option to take the CTA. The new arena site totals just over eight miles and a 30-minute "El" ride to the South Loop. With fundraising for the new arena the next step, DePaul will look for a private donor(s) to help contribute with naming rights. It’s a process that has some time until 2016 when DePaul is suppose to begin playing games at the arena, Emanuel said. The foundation has been proposed and Purnell still has a lot of work to do with a program that has only won seven conference games over the last five seasons. A top-100 recruit in Garrett Jr. and former top-50 recruit in Hamilton Jr. is a start. But he’ll now have a first-class selling point he can offer to prospects, something he hasn’t been able to do in the past. Not since the days of Quentin Richardson (Whitney Young) and Bobby Simmons (Simeon) in the late 1990s has the program had local prep stars lead the program to the NCAA tournament. Some think the new arena will now give Purnell the leverage he needs to match up with other coaches around the country.